Brain Tumors: What Are the Treatment Options? Tumors can be found in many areas of the body and various parts of the brain. Treatment for any type of tumor depends on the type of tumor, its location, its stage, and the patient’s health as well as many other factors. In the case of brain tumors, doctors consider the location of the tumor in the brain as well as the size and shape before recommending a treatment. 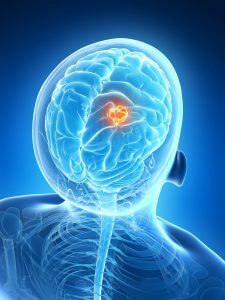 A tumor is an abnormal growth of tissue; brain tumors refer specifically to abnormal growths in the brain. Not all tumors are cancerous, but all can potentially be dangerous. Tumors that are non-cancerous are called benign tumors, while cancerous tumors are called malignant. Benign tumors do not have cancerous cells, grow slowly, and are not likely to spread. Benign tumors do still grow and can potentially inflict damage on the brain. Cancerous tumors are life threatening, will grow rapidly, and can spread to other areas of the brain and the spine. Almost 700,000 Americans currently have a brain tumor. Approximately 20% are malignant. The average survival rate of malignant brain tumor patients is 34%. Brain tumors can cause both physical and cognitive side effects, both permanent and temporary. Benign tumors can cause severe symptoms and even be terminal when affecting certain parts of the brain. There are more than 120 different variations of brain tumors. One treatment option for brain tumors is surgery. A specialized surgeon carefully goes into the brain and surgically removes the tumor. Depending on the tumor and the patient, doctors may decide to remove the entire tumor, remove part of the tumor, or just biopsy the tumor. Often surgery is combined with other treatments. Radiotherapy is the treatment of tumors through radiation, in which high amounts of radiation are applied to the tumor. This type of treatment can be targeted and your doctor may choose to apply radiation just to the tumor, the tumor and its surrounding areas, or the entire brain depending on the circumstances. Radiotherapy can be used as a lone treatment or it can be combined with surgery. Chemotherapy is sometimes used in the treatment process of brain tumors. Chemotherapy is essentially a poison used to attack the tumor, and it can be taken orally in a capsule or as an intravenous injection. Chemotherapy is not used as commonly in treating brain tumors due to the fact that the chemotherapy may not reach tumors in certain parts of the brain. Medical professionals are always working to find better ways for treating cancer. Clinical trials essentially test new methods. Qualifying individuals can participate in the trial and receive the experimental treatment. Clinical trials help to advance medicine and are an extra option for individuals not responding to other treatments. The CyberKnife System is a new way of treating tumors. CyberKnife is an advanced system for administering radiation. This technology can help remove the need for invasive surgery. The CyberKnife System is the first and only dedicated system with the ability to track the movement of the tumor during treatment. This tumor-tracking technology allows for precise radiation doses delivered directly to the tumor. It uses image guidance and computer controlled robotics to achieve effective results. Treatment for brain tumors with CyberKnife does not require the use of an invasive head frame; all that is required is a soft, mesh mask for the patient to wear during treatment. Learn more about the CyberKnife System at Phoenix CyberKnife & Radiation Oncology Center.